The newest fragrance created by perfumer Christopher Sheldrake for Les Palais Royal de Shiseido and Serge Lutens,Mandarine Mandarin, has its place in the line-up of usual suspects for things weirdly appealing. A tradition that Lutens is keeping with religious zeal injecting a little je ne sais quoi in his compositions that keeps everyone guessing if this is an inside joke of a man of humble beginnings playing a nasty one on the bourgeois who flock in Palais Royal or the jarring string note of a genius quartet that is knowingly swayed by fervent feeling and not impeccable technique. From the alarming menthol opening of Tubereuse Criminelle to the strangely pleasant unwashed intimates of Muscs Koublai Khδn, making a stop at the rough bitterness of dark chocolate and patchouli of Borneo 1834, his exclusive range especially is unconsolidated with weird notes of an alchemical nature that result in perfumes of distinct character and astute modernity. Mandarine Mandarin has the edge smoothed a bit, making it an approachable and wearable exclusive for people who like oriental compositions as a rule. An intelligent play on words, it alludes to both the succulent fruit with the tart aroma and the Chinese language/dialect of intellectual officials during the great dynasties of Chinese history and still spoken today. And indeed the fruit got its name because it was exploited by those high-ranking government officials in China (mandarins). 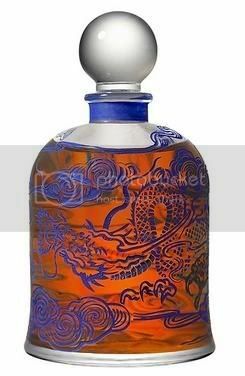 The limited edition bottle for Mandarine Mandarin depicts a blue Chinese dragon coiling around the familiar bell jar which is filled with a deeply orange jus. The official notes include Chinese orange, nutmeg, candied mandarin, orange peel, smoky tea, labdanum, tonka bean and ambergris. It is available from Les Palais Royal Shiseido in Paris or on-line for people residing in Europe. Mandarine Mandarin, a journey into the phases of a citrus, manages to evoke different stages in a mixed up sequence that defeats linear storytelling going back and forth all the while. As the vial opens, it smells like scraping nails on the peel of a ripe mandarin, tart juicy aroma, lifelike in much the same way as L’artisan Mandarine tout simplement is, for the first couple of minutes. As you pick the fruit in your hand to unpeel it hungrily though the dark hidden side of it reveals it has spoiled, the particular rot of hesperidia left in a damp cool place for quite some time, matte green turning to grey-white skin smelling ammoniac-laden, almost repulsive. A dry tannic smell that subdues the candied peel which appeared in Le Myrrhe first (allied there to sweet honey, amber, jasmine, sandalwood, bitter almond and lotus, making it a sweet confection rather than the drier ingredient it is inspired of). The ambery depth of Mandarine Mandarin makes its presence known from the start almost and because it is very much an orientalised tale of places closer to the Middle East than the Far Orient the glorious addition of Arabian spices laces the vanillic fruity marmelade that ensues. And when you’re almost ready to think it’s really a play between sweetness and rot, life and death, maturity and old age, there comes the reminder of youth in the form of a radiant orange blossom note. Not wide-eyed innocent, nor inexperienced but with the mellowness of Fleurs d’oranger (notes of orange blossom, white jasmine, Indian tuberose, white rose, citrus peel, hibiscus seeds, cumin, nutmeg) and a whisper of its feminine seductiveness. It’s what remains on the skin poised for hours. Pic is of the limited edition dragon bell jar courtesy of Autourdeserge.